Nudie suits are flamboyant, rhinestone-encrusted cowboy outfits worn country-western singers beginning in the 1950s. The suits were popularized by the so-called “singing cowboys” of Hollywood like Gene Autry and Roy Rogers. They moved Southern California in the early 1940s and started making clothes out of their garage. Struggling country singer Tex Williams bought Cohn a sewing machine in exchange for Cohn’s flashy, custom outfits, and their creations soon gained a following and caught the attention of Spade Cooley, Cliffie Stone, Lefty Frizzell, Porter Wagoner, and Hank Williams. The future looked bright, but before they could take on any more clients they needed space. They opened their first shop, Nudie’s of Hollywood, on the corner of Victory and Vineland in North Hollywood, Calif. In the early ’50s they took a chance and approached Roy Rogers and Dale Evans, and eventually became their custom tailors. Cohn and his wife dressed them for appearances and soon became good friends with them. Their custom creations had soon become synonymous with the era’s most famous, successful country stars. Business wasn’t showing any signs of slowing, and in 1963 they moved to a larger location, renamed themselves “Nudie’s Rodeo Tailors,” and continued clothing some of the biggest celebrities of all time: John Wayne, Gene Autry, Elton John, George Jones, and John Lennon, to name a few. He also dressed groups including Chicago, ZZ Top, the Rolling Stones, America, and The Flying Burrito Brothers. By the ’60s, Nudie suits had become a part of the country music establishment. If a star was performing at the Grand Ole Opry, odds were they’d be doing it while wearing a Nudie suit, but the flashy suits weren’t just popular among country stars. In 1962 Cohn designed a peach-colored suit for Porter Wagoner complete with rhinestones, a covered wagon on the back and wagon wheels on the legs. Wagoner went on to become one of Cohn’s best customers. He’s admittedly acquired 52 Nudie suits, each costing between $11,000 and $18,000. By the end of the ’60s, Cohn’s work transcended clothing. 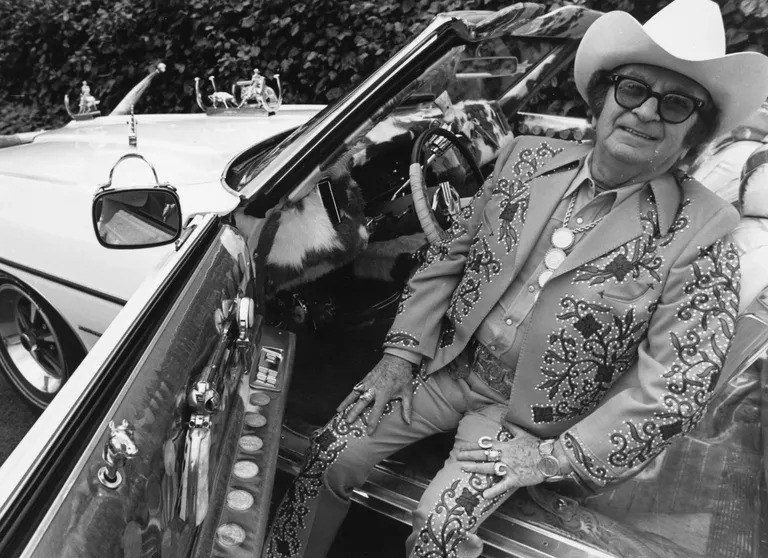 He got into the custom car business, making tricked out “Nudie Mobiles.” His most famous is the pistol-studded car he designed for Webb Pierce. It’s currently on display at the Country Music Hall of Fame in Nashville, Tennessee. Gram Parsons‘s Nudie suit had a distinct counterculture vibe. It was emblazoned with marijuana leaves, naked women, pills and poppy flowers. The suit appears the cover of The Flying Burrito Brothers’ 1969 album The Gilded Palace of Sin. Elvis Presley’s gold lamé suit had one of the biggest price tags of any Nudie suit: $10,000. It appears on the cover of Presley’s 1959 album 50,000,000 Elvis Fans Can’t Be Wrong. Hank Williams‘ most iconic outfit was a white Nudie suit with musical notes stitched along the sleeves. Mainstream country fashion shifted in the ’80s and ’90s and all-black attire became all the rage, as artists favored more casual performing getups. Nudie suits certainly aren’t as popular as they once were, but they do make the occasional appearance. Cohn passed away in 1984 at the age of 1981. Nudie’s Rodeo Tailors closed its doors in 1994, but they still continue to offer custom, one-of-a-kind suits, jackets, and dresses for men and women. His creations are on display at the Country Music Hall of Fame. Cohn’s daughter, Jamie Lee, has kept the Nudie suit tradition going. Her ex-husband, Manuel Cuevas, served as the onetime head tailor, and after their divorce, he moved the Memphis and launched his own brand. His son, Manuel Cuevas Jr., designed a custom Nudie suit worn by Wilco lead singer Jeff Tweedy during the band’s 2008 performance on “Saturday Night Live.” Nudie suits have also been sported by the likes of Bob Dylan and Jack White. Here are some of our favorite suits that Nudie made for George Jones! Trio of suits made for George Jones by Nudie Cohn on display at the George Jones Museum in downtown Nashville, TN. Suit with embroidered roses made for George by Nudie Cohn. George Jones wore this Nudie suit to commemorate his first #1 hit “White Lightning” in 1959. Designer Nudie embroidered lightning bolts and moonshine jugs on the coat, while brightly colored music notes dance around the arms and legs of the suit. To see more suits and other George Jones memorabila please visit our ticketing page for tickets to the museum! See y’all there! https://georgejones.com/wp-content/uploads/2019/01/Nudie-W-Cover.jpg 2000 3000 Brindy https://georgejones.com/wp-content/uploads/2019/02/George-Jones-Horizontal-Logo-1030x283.png Brindy2019-01-28 18:32:512019-02-01 16:54:55What is a Nudie Suit?